After my kids learned that wolves can smell a prey from two miles away they asked me to come up with some ideas for exploring the sense of smell. Can you imagine two miles!? We have a favorite cafe that is two miles away from our house. Kids walked this route multiple times (we love to walk) and it seemed mind-boggling to them that we could sit in our house and smell what the cafe is cooking for dinner special that day. People have been fascinated by wolves from the beginning of times. I don’t think there are many animals that instigated such a deluge of fables (Aesop had at least 14), folk tales (Little Red Riding Hood, Three Little Pigs, Peter and the Wolf, The Boy who Cried Wolf, The Goat and her Three Kids to name just a few), poems and, of course, books, from Kipling and London to Mowat and Paver (our favorite). If you go to Goodreads and enter “fictional wolf books, no werewolves” you will get a list of hundreds of books. For some writers, wolves are a symbol of strength, independence, and freedom. For other writers, wolves area symbol of danger, treachery a, d destruction. We had a lot of fun exploring interesting facts about wolves. You can print the Fact Cards HERE. We like to cut out the cards and laminate them. Wolves are fascinating in many different ways. They are beautiful, highly intelligent and extremely loyal. They also have a sense of smell that is 100 times better than humans. You can begin exploration of the sense of smell with your kids by asking, why do we need a sense of smell at all? If kids have trouble getting started you can give them a hint. Would smelling fire alert you to danger and prompt you to get out of a burning building? Would smelling tasty foods help you know that it’s ok to eat them? If you want to have more fun with senses, follow the directions below. Any other things with smells that travel easily. Some suggestions: freshly minced garlic, sausage that has been thrown in a pan for a few minutes). Note: this experiment can be done inside or outside. It’s obvious that outside smells will disperse in a completely different fashion than indoors. The purpose of this experiment for us was to see that our range of smell is much less than two miles, so the nuances of a foot of space or two do not make a difference. One child stands blindfolded at the end of your workspace. Another child (or adult) holds a cotton ball soaked in vinegar/ lemon juice/ lavender (one at a time!) and starts slowly moving in the direction of the blindfolded child. This second person needs to stop from time to time to ask the first child if it’s already possible to smell something. The job of a first child is to detect a smell and guess what it is. Use a tape measure to find out how many feet away the smell could be detected. What was the easiest to detect? Vanilla Bean was the most aromatic item in our collection and the easiest to handle. Kids could just grab it with their fingers and wave it in the air as they walked. Lemon juice freshly squeezed on a cotton ball caused the most confusion. Spray perfume in the direction of the blindfolded child standing a few feet away. Start the timer. How long does it for the smell to travel? On a windless day, it took Benghal by Lancome 15 seconds to travel 7 feet. The blindfolded child didn’t know what we were planning to do. The instruction was to stand still and tell us when something “smelly” can be detected in the air. If you have a group of children, have them stand in a row. Stand at one end of the line and spray perfume along the row. Who can smell the perfume first? Why is that? Brew tea using a single ingredient. Blindfold the child and slowly put a cooled-down tea in front of his/her nose. Can they use their sense of smell to guess what is the tea made of? Some of my favorite things to use for tea are dried apricots, dried blueberries, and dried apples. If you have never made a fresh fruit tea before, simply put a bag of dried fruits like dried apricots in a blender and run it until it is completely minced. Measure one tablespoon into a cup and pour boiling water over it to brew it. This fruit tea will have an intense, fruity smell. You might want to add a dash of honey for taste after you are done smelling it. I bet your kids will absolutely love it. My kids got so excited about smelling things that they refused to be done. We gathered some other things from around the house that have strong smells that we didn’t include in the first experiment and put them to the test. Put one smelly object in front of a blindfolded child at a time. Write down the number, the guess and if it was correct. Go through all the smells. Now take the blindfold off and count the correct guesses. Speculate why some things were easier to guess than others. What smelled good? What smelled bad? Are some smells more familiar than others? Do some things have a more intense smell than others? Would wet dirt smell more than dry dirt? What do you think of our ideas for exploring the sense of smell? The third experiment The Mystery Tea was the biggest hit with my children. Mostly because they got to drink some yummy tea at the end of it! This post is part of A-Z Animal Series organized by Nadia from Teach Me Mommy. Check out crafts and activities for each letter of the alphabet from some of the best kid bloggers around the world! So many fun ideas! Thanks for participating in the series! 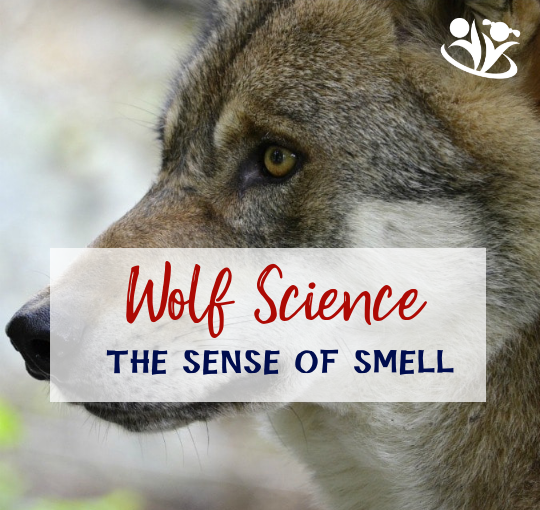 Hey Buddy!, I found this information for you: "Wolf Science: exploring the sense of smell". Here is the website link: http://kidminds.org/wolf-science-exploring-sense-of-smell/. Thank you.